I have continued to test various brands of watercolours and add all the samples to my website here so you can compare them side by side. 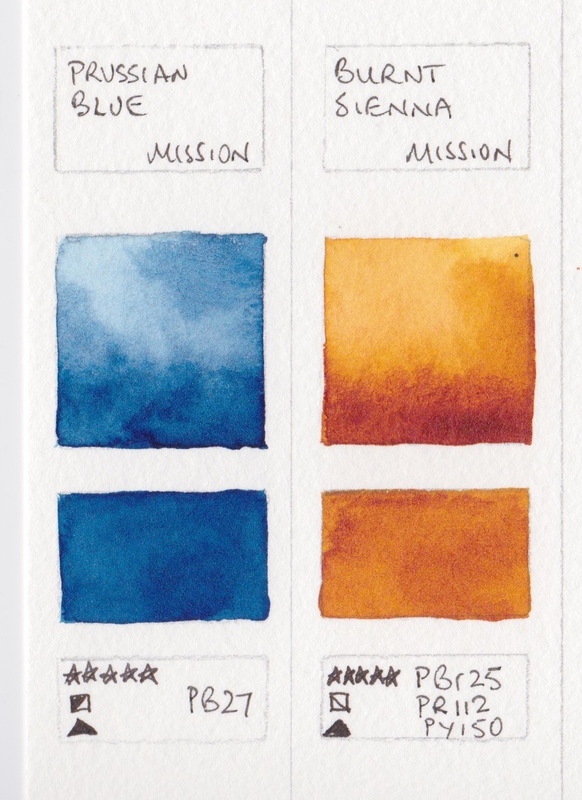 Some of the latest I have tried are Mission Gold watercolours from Korea, which were launched a few years ago. They are made by Mijello, who have also created some very innovative palettes. Initially they had a number of fugitive pigments and have reformulated many of their colours. They now have a range of 105 colours, some of which are lovely, but you would have to pick and choose what you might try and read not only the colour name but also the pigment numbers as otherwise you'll get a number of surprises! Take Burnt Sienna for example. This should be made from PBr7 - though often the transparent PR101 is used - and should be a neutral orange that is useful alone or mixed with Ultramarine to make a huge range of hues, including great greys and deep warm browns. Mission Gold Burnt Sienna looks like a deep Quinacridone Gold hue - there's no way this would make greys with Ultramarine! It is made from PBr25, PR112 and PY150 - all perfectly good pigments but not burnt sienna PB7. Why? No idea. It's a lovely colour but it isn't Burnt Sienna. On the other hand - Prussian Blue, also picture left, is exactly what you'd expect - a cool, slightly neutralised blue, made from PB27. 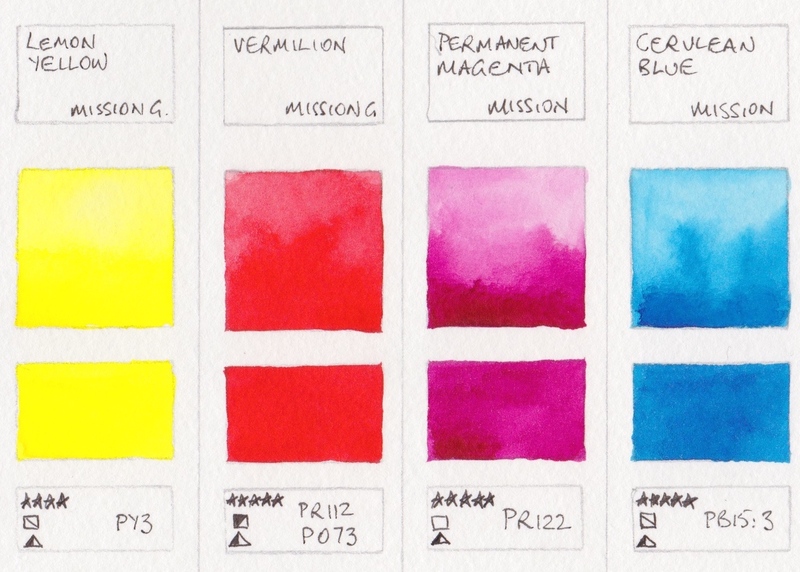 I scanned these in a fairly random order, but you can see Permanent Red (PR112), Permanent Yellow Deep (PY65), Prussian Green (PB27 + PG7), Crimson Lake (PR202), Cobalt Blue #2 (PB28) - this is Genuine cobalt blue, Cobalt Blue #1 (PB29 +PB15:3) - this is a hue that doesn't resemble cobalt blue in any way. Why? Once again, it's not helpful. Then there are two versions of Ultramarine: Ultramarine Light which is a regular PB29, and a slightly warmer version with PV15 added called Ultramarine Deep. They are not different enough to need both though I prefered the single pigment version. I've also tried the Lemon Yellow PY3, Vermilion PR112 + PO73, Permanent Magenta PR122 and these all painted out beautifully. The last of this set, Cerulean Blue PB15:3 is a standard phthalo blue and should be called Phthalo Blue - it's nothing like a Cerulean. Permanent Red Deep is a gorgeous deep red - almost a crimson - that also painted out beautifully. Looking at the colour chart, there are very few earth colours that are not a mixture of pigments. Once again I don't understand this. Earth pigments are wonderful and not expensive - why fiddle with them? What I found interesting though is that these paints claim to have a small drying shift, and they do dry very bright. It makes me wonder exactly what binder is being used as there is normally quite a large drying shift in watercolours. Update April 2016 - I now have samples of all the 105 colours so will update this blog here and my website soon. 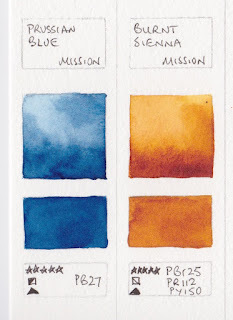 I like Mission Gold watercolours. They are really vibrant. I bought the 9-tube set to try and so far they perform quite well. The thing that throws me off is how they name their colours. Burnt Sienna isn't like Burnt Sienna of other brands. Then there's Peacock Blue which is like Phthalo Blue. Another brand you might want to try is Kremer Pigments. They have a lot of granulating pigments. Amazon is selling a 14-full pan set at USD $80 (not including shipping). Thank you for your interest on our product. Burnt Sienna are made to express, for example, a sunlit trees in forest. Something that is a vibrant and dazzling. If you would like brown color that is made of pbr7 pigment, we have w566 Vandyke Brown which is only made with pbr7.